Mattia Casalegno’s work investigates human physicality: in his works, the viewer is challenged to question their own body and its sensorial reality. His practice draws from anthropology, biology, ecology, neuroscience and deploys a range of expressive forms and technologies, with a particular focus on interactivity and the digital. After his participation in DIGITRA 2016, he was invited to the Civic Museum of Bassano del Grappa by the curator Ennio Bianco to engage with the rich Neoclassical heritage present in the region of Veneto. 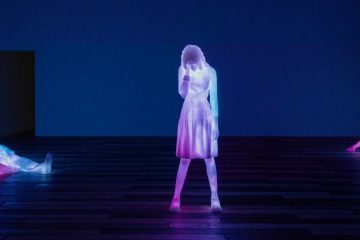 “The Knowledge of the Body” is a multi-platform exhibition that reflects on the evolution of beauty and corporeal perfection in contemporary society. 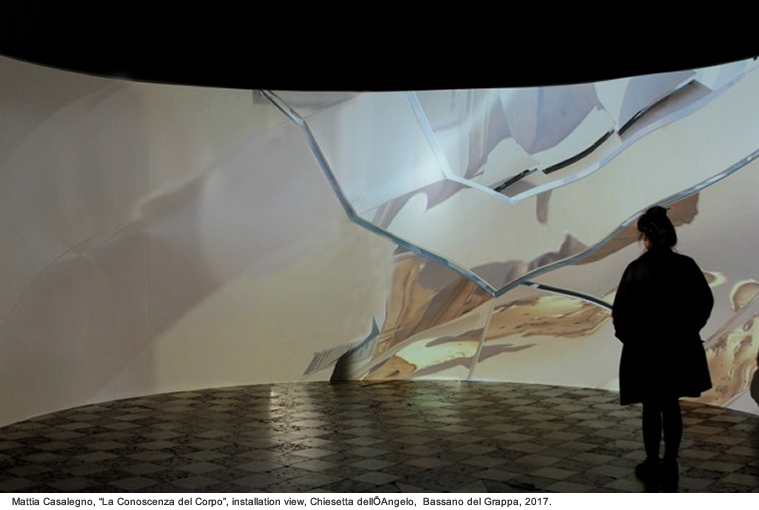 On view from May 6th to June 25th at Chiesetta dell’Angelo and at the Civic Museum of Bassano del Grappa, the exhibition features a series of sculptures and a site-specific audiovisual installation. With the use of photogrammetry, Canova’s statues at the Civic Museum have been scanned and digitized. While Canova’s iconic works are often credited as exemplary of universal beauty, Casalegno has chosen to focus on the errors and imperfections that come from digitization, a sort of inversion process that brings back the idea of the body to a human level. 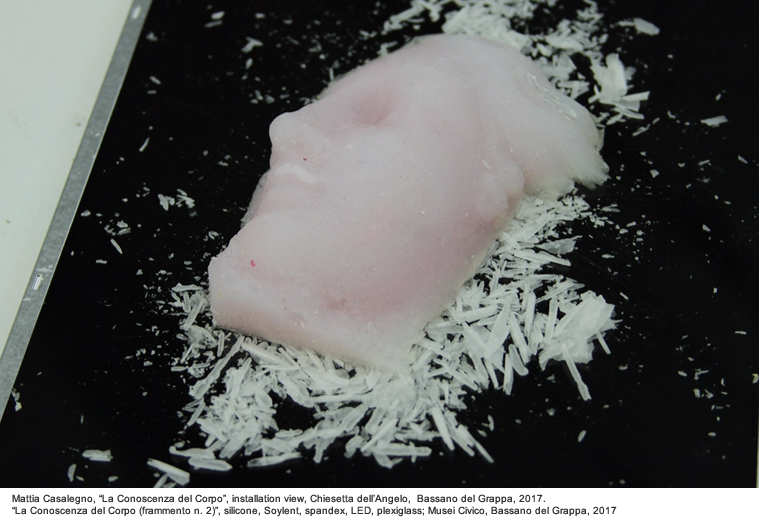 In response to a canonical history of art that emphasize durability and immutability, Casalegno brings in strong elements of impermanence: ephemeral videos and sculptures produced with perishing materials, such as silicon and Soylent, a powdered nutritional supplement commercialized as a food alternative. Federica Patti: Ennio, can you talk about the project: what is the link between Canova and the city of Bassano del Grappa? Ennio Bianco: Bassano del Grappa and Possagno, Canova’s birthplace, are one of the most important places to see his art in the entire northern region of Italy. One of the most important rooms in the Civic Museum in Bassano hosts the work of the sculptor, gifted to the Museum by his brother-in-law, Monsignor Giambattista Sartori, and by Pietro Stecchini. The collection comprises of not only sculptures and sketches, but also numerous notes and drawings. The Museum is also the only place to carry the monochrome sketches on canvas. 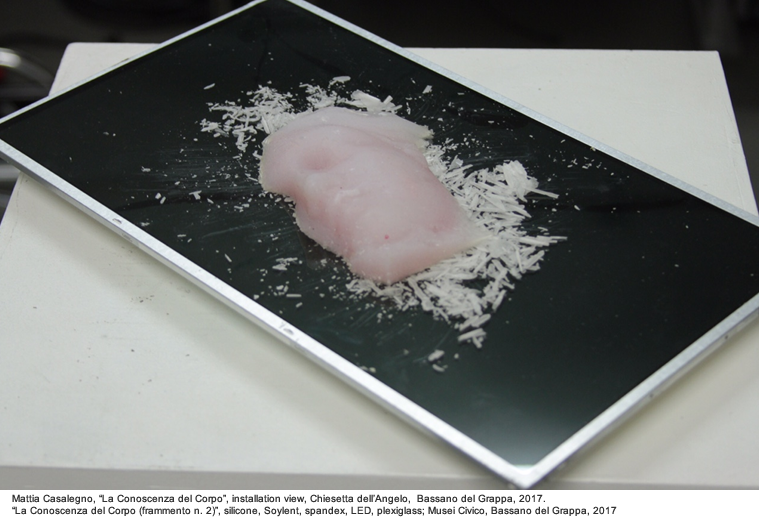 Although all these works have been extensively studied and reviewed in conferences, symposiums, and publications in recent years, this project aims to recontextualize the work with particular attention to the emergent languages of contemporaneity and more specifically of digital art. Federica Patti: Why did you choose to work with Casalegno? Ennio Bianco: Chiara Casarin, the new director of the Bassano’s Museum, and I sought to work with Mattia because of the high aesthetic value of his work. I may use the term ‘beauty’, but I recall a quote by Durer: “What is beauty I do not know”. The visually compelling and visceral qualities of Mattia’s work allows an audience who doesn’t have experience with digital languages to appreciate the work, and ultimately offeres an entry point to the sophisticated concepts underlying the project. 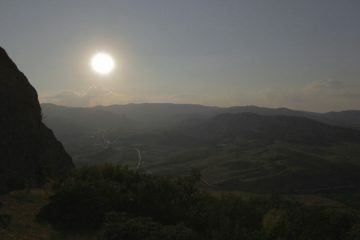 Federica Patti: Why the venue at Chiesetta dell’Angelo? Ennio Bianco: Besides being one of the most appreciated venues for contemporary art in the city, it is a perfect space specifically for digital arts for its architecture, which favors immersive and large-scale audiovisual works. We are currently discussing about expanding the technical capabilities of the space for future exhibitions and even possibly installing an immersive environment, or Cave. Federica Patti: I’ve been noticing it’s very common within media artists nowadays to work with historical masterpieces. What’s your take on this and how do you see these projects in the broader contemporary art discourse? Ennio Bianco: It’s true, some Italian artists are creating a dialogue with famous artworks of the past – although not that many. I think the themes these artists engage with are the broader themes of contemporary art. The fact they engage with the masterpieces of their art tradition is something I think is inevitable and part of the game. I don’t see why, say, Chinese, Indian, South African or Cuban artists can engage with their identity values while Italian artists must deny their visual and cultural DNA. Casalegno is fascinated by the art of a master such as Canova, but then again he addresses how the ideal body of Canova is so detached from the human body in general. It is a fictitious body – there are no wrinkles, the skin is like porcelain, they are like perfect machines. From this premise he talks about the idea of corporeal beauty of today: a body that must always perform at its best: optimized, quantified, and ever expandable. Technologies define what our bodies can or cannot do: from the fields of medicine and science, to the advancement of materials in sports, up to the engineering of food. 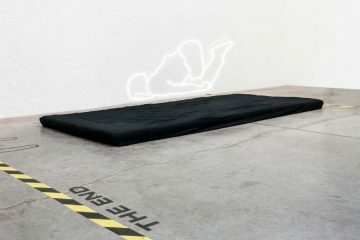 In the video installation Casalegno chooses a symbol that points to the ideal of perfection, which he finds in the design tradition of sport cars. He represents this by his use of the Lamborghini, the most recognizable type of its category. Federica Patti: So the importance of the body..
Ennio Bianco: The focus on the corporeality is not only addressed in the wellness and medical industry. Even in the field of artificial intelligence, for example, studies are discovering the importance of the sensorial, the physical: man knows through the entire body. 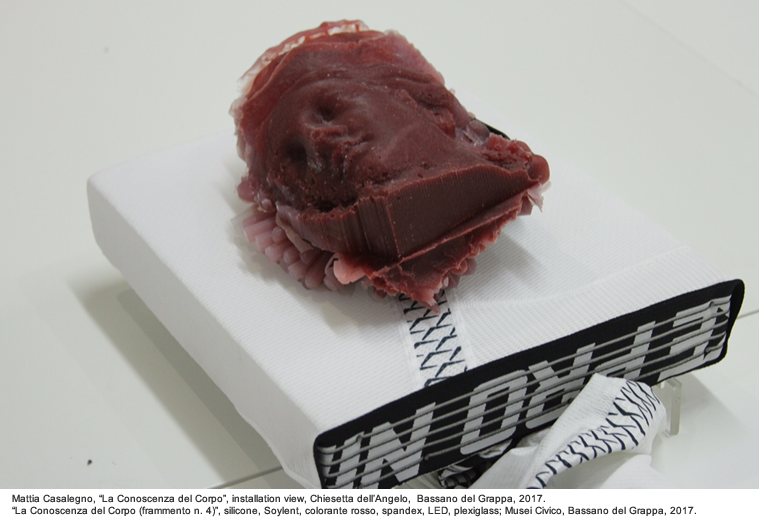 Federica Patti: Mattia, I think these sculptures series are an evolution of your practice, but they still keep some specificity to themes in your work. The first is a focus on composite materials and synthetic food compounds: after the Rubisco, now we see the application of Soylent. Another is the centrality of the human body, intended as an aesthetic and perceptual subject. 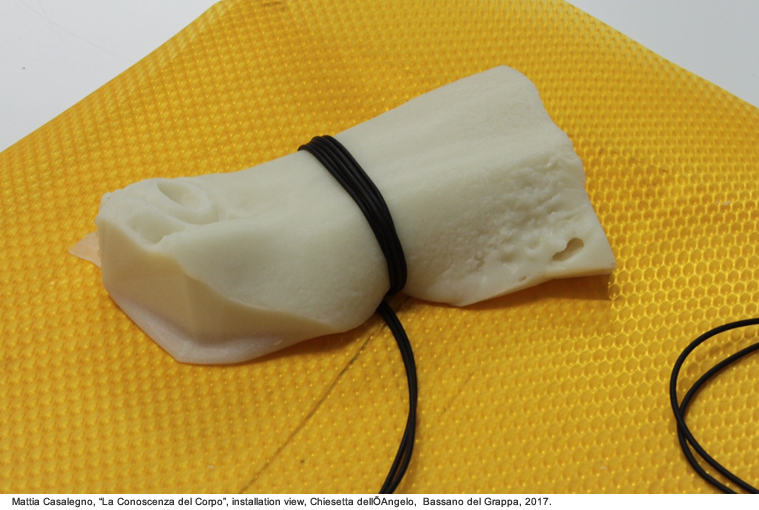 And lastly, this blurring between the human and the technological body..
Mattia Casalegno: I’m fascinated by materials that perish, grow, evolve, decay. In the RBSC.01 project I used basic elements such as flour and water, while in others I used glycerine, meat, crystals, biodegradable plastics. For this new series of sculptures, we first 3D printed molds that were then casted with composites we developed at my studio, made with silicon and Soylent, a powdered food substitute sold in the US. Soylent is marketed as a complete diet, an alternative to your daily meals. You can only buy it online and two glasses have the same caloric intake as one meal. In my view this kind of synthetic food is a metaphor for a very consumeristic and utilitarian way of eating food – understood as mere assimilation of nutritional elements, completely detached from the pleasure of eating: taste, smell, and conviviality. It’s a good metaphor for the relationship we have with our body in our contemporary culture: a machinist vision, focused on the functional optimization, often beyond natural limits. Federica Patti: What is photogrammetry? How did you decide on the content and why? Mattia Casalegno: Photogrammetry is a way to digitalize artifacts, usually used in archeology: through the use of a digital camera you ‘scan’ a physical object and create a digital model of it. For this phase of the project we collaborated with the company Serviziarcheologici.it and with Carlo Baione, whom I want to thank for the amazing work. The interesting thing to me about photogrammetry is that, unlike a laser scan, it is possible to digitalize details of the surfaces – the textures, the “skin” of the objects which can be then used in 3D modeling software without the need of adding further details in post-production. For this particular project I had access to the entire collection of Canova’s pieces at the Museum, and I decided to focus on parts of the statues because of their formal qualities: folds, fissures, recesses, curves. I was not that interested in reproducing a faithful copy of the original but instead I wanted to use the glitches and the imperfections of the scanned details. Federica Patti: Hardware and interaction are somehow disappearing from your practice: why? 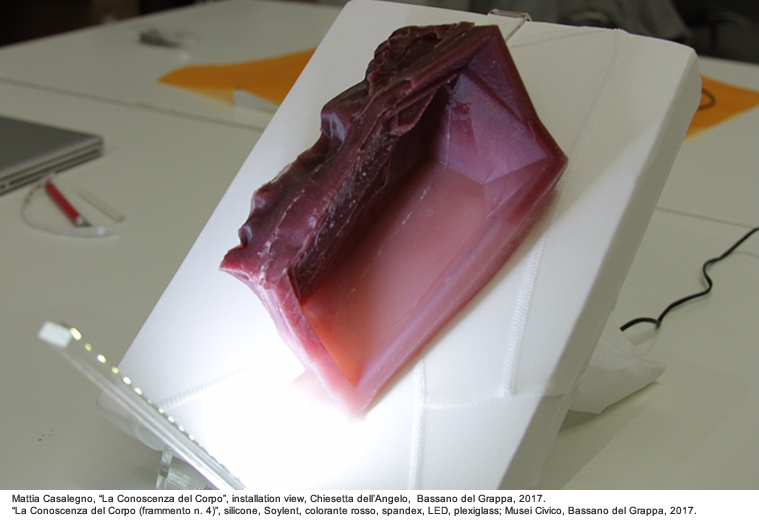 Mattia Casalegno: Yes, in this project I thought a lot about the space and spent a lot of time investigating new materials. But I still engage a lot in relational work. I currently have a show at the YAA Museum in Florida comprised of a large interactive piece and wearable pieces. In a way each work is a story in itself, each project requires different approaches and strategies. Federica Patti is an independent curator who lives and works in Bologna. 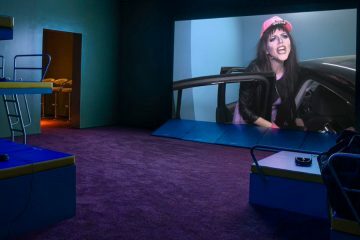 Her research focuses on contemporary experimental art movements, with particular interest in multimedia, emerging artists and interactive and participatory projects. 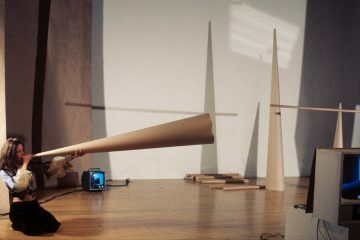 She co-founded roBOt, an international festival dedicated to digital arts and electronic music. In 2010 she co-founded SPAZIOBARNUM, a non-profit space in Bologna focused on the presentation and development of her research topics. In 2012 she joined LaRete Art Projects. Since 2013 she is frequent contributor for Artribune magazine and Digicult.